A couple with two young children loved the charm of an antique farmhouse and barn in Kennebunk, Maine, but wished that it had more modern elements, too. So they decided to build a four-bedroom home on the land that would give them everything they wanted. They hired Caleb Johnson Studio to take on the project, and the team got started by gathering materials that they could reuse. There were the things they could find in the farmhouse and barn, but in another bit of sourcing luck, they also had their pick of pieces from a teardown site in Weston, Massachusetts. 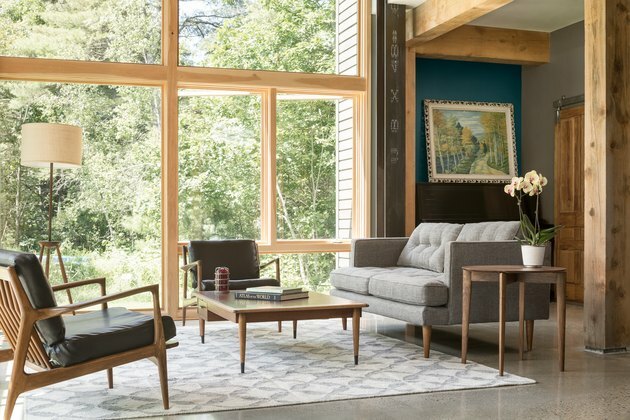 Johnson incorporated elements from the farmhouse in the timber roof structure, interior wood cladding, and interior doors, and saved the cabinetry and fixtures from the Massachusetts house. But construction wasn't all about recycling. 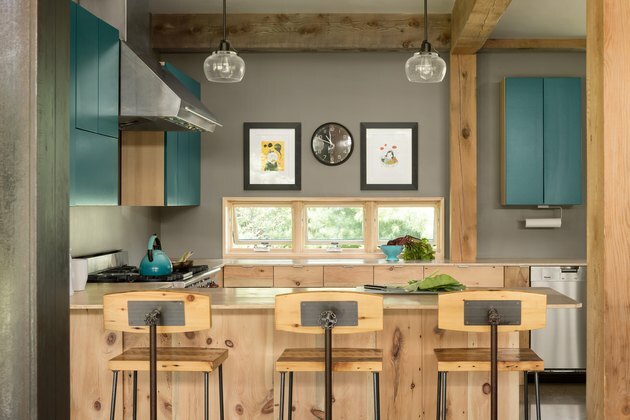 Johnson and the team worked some new, sustainable materials into the design, too — including Maine cedar, hemlock timber, and steel — to create a modern feel. In fact, the steel was left unfinished to develop a warm patina over time, which is the perfect choice for this young family. Now that they have their dream home, they'll be here for a while. 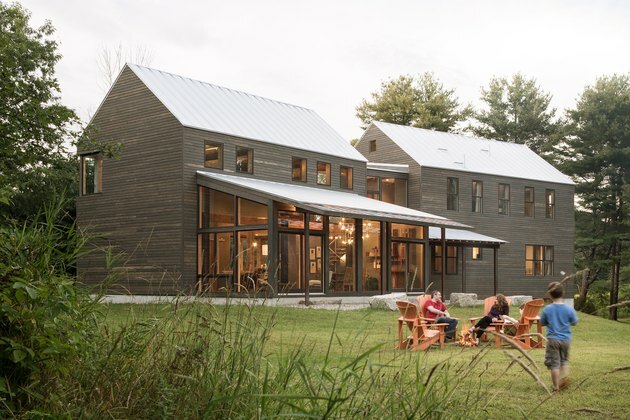 The house's shape evokes a classic barn, while expansive Marvin windows bring in plenty of light. The exterior is clad in custom siding stained in Benjamin Moore's "Dragon's Breath." 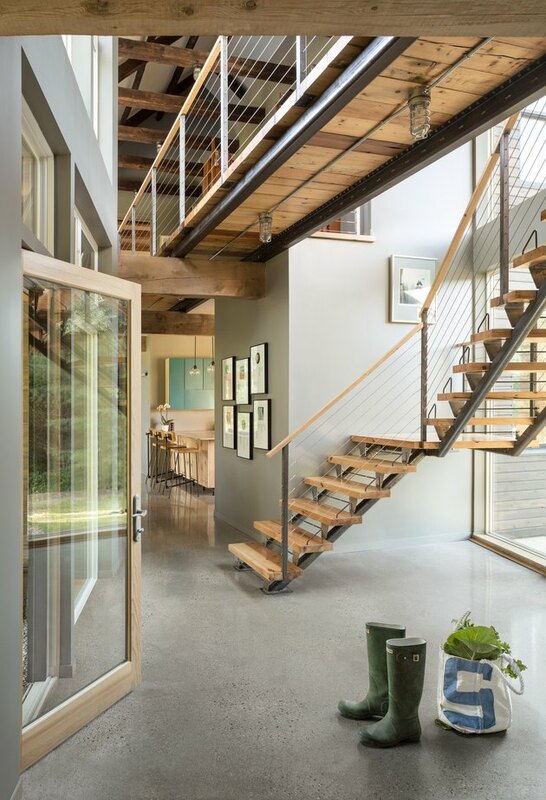 The bright and airy entry hall's steel and reclaimed pine stairs are open to let light flow through the space. Hemlock and steel beams are left exposed in the living room, creating a contrast between rustic and modern. The antique Lane chairs and coffee table add a midcentury vibe. In the kitchen, Ikea cabinets were finished with reclaimed pine and the concrete floor is equipped with radiant heating. Whimsical artworks by Stivo hang above the window. 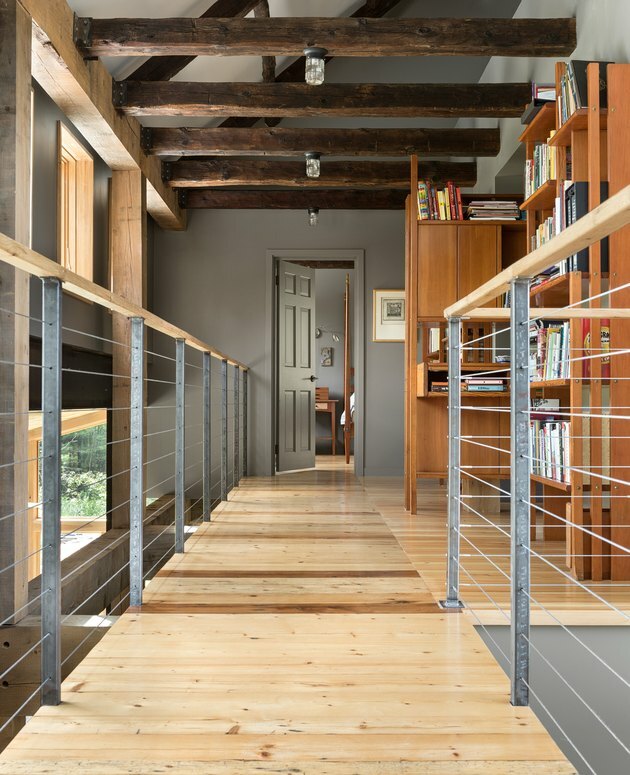 The bridge showcases reclaimed pine flooring and millwork and a reclaimed antique timber frame. The bookcases that line the space were salvaged from the midcentury house in Massachusetts. Antique timber beams are the center of attention in the master bedroom. 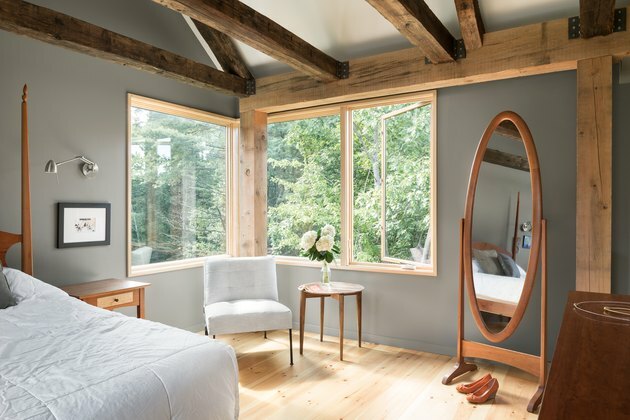 The custom bed and Dovetail mirror and dresser complement the hemlock posts and pine floors. 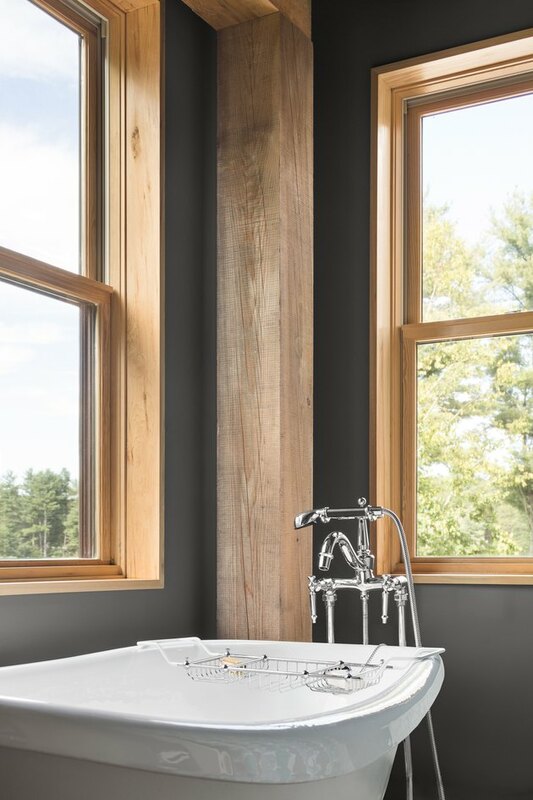 The master bathroom's Kohler bathtub looks out onto the property. 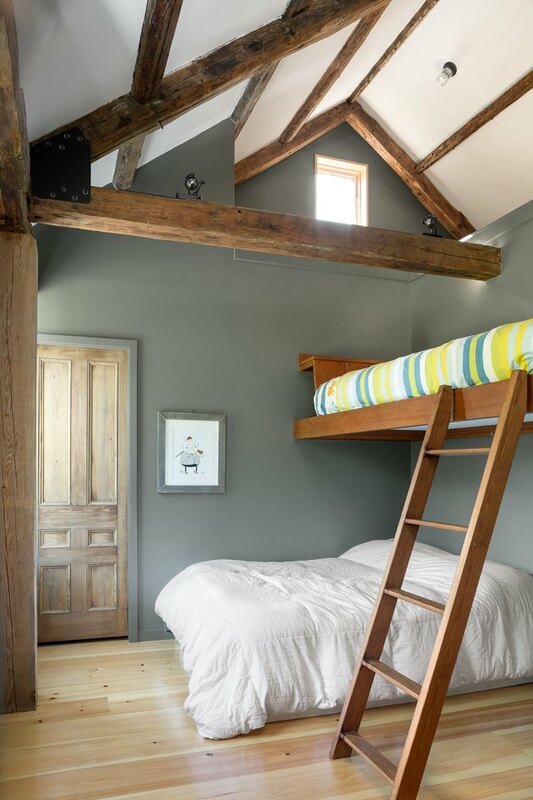 A kids' room is outfitted with a slumber party–ready reclaimed bunk bed. 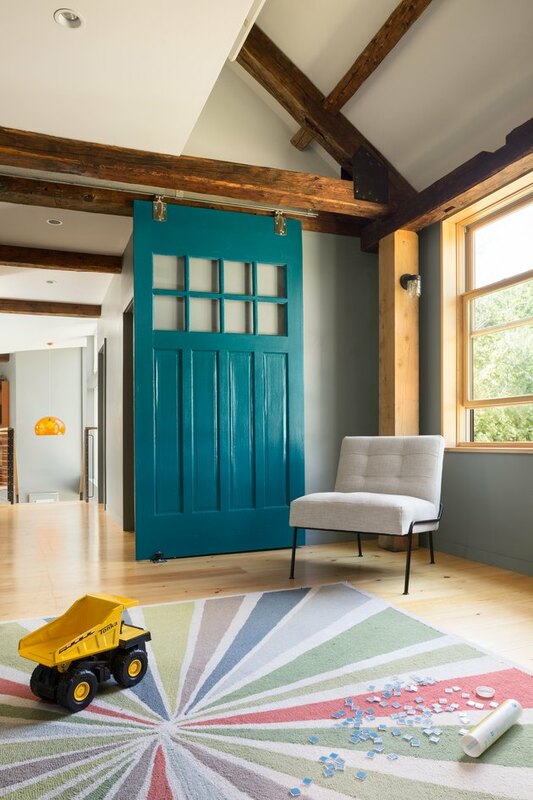 The antique door was salvaged from the farmhouse on the site. A reclaimed barn door was painted in a bright teal and installed in the children's den. The rainbow rug covers the pine flooring and creates a comfy spot for play.